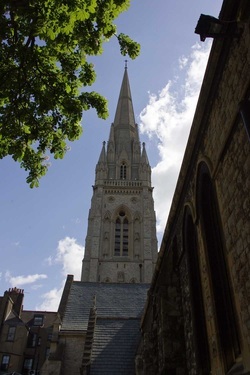 During the 18th and 19th centuries, the population grew considerably but until the early 19th century, St Mary Abbots was the only church in Kensington, with many eminent parishioners including Sir Isaac Newton, Joseph Addison, William Wilberforce, George Canning, William Thackeray and Lord Macaulay. However, between 1845 and 1873, 21 new churches and parishes were founded. The remaining parish, however, was still of significant size. By the 1860’s, therefore, the church was again considered too small; it was also in a serious state of dilapidation and decay, with the woodwork ruined by dry rot. The vicar, Archdeacon Sinclair, was the driving force in the years of rebuilding and fundraising, his first letter containing the memorable words: ‘the house that is to be builded for the Lord must be “exceedingly magnifical” - the work is great - for the palace is not for man but for the Lord’. The first intention was to build a new church immediately adjoining the existing one in gardens to the north of the churchyard. George Gilbert Scott RA (later Sir George) was appointed architect, and he advised that the present site was ‘hardly to be surpassed for convenience and grandeur of position’. He presented plans for a new church to be contained within the limits of the present churchyard, the building to have ‘a degree of dignity proportioned to the rank and position of the parish for which it is intended’. The plans were accepted, the previous church demolished and, under contract to Dove brothers of Islington, the building work went swiftly forward, as did the collection of funds.